October 18th, 2008 To get where your going, you've got to know where you've been. The Eagles beat a ranked (#17) Tech team back in the middle of October at Boston College. Despite quarterback Chris Crane throwing three interceptions, two which were returned for touchdowns, the Eagles bested the Hokies 28-23. A 21-point second quarter was enough for the Boston College defense which allowed just two field goals in the second half. 1st year running backs Montel Harris and Josh Haden ran for 99 yards on 24 carries while senior receiver Brandon Robinson caught four balls for almost 100 yards. That stingy Boston College defense, which has become a staple of their season, allowed just nine points on three field goals the entire game. Led by their junior future Butkus award winning linebacker, Mark Herzlich, who finished the game with 13 tackles including 8 solo. This wasn't a flashy Matt Ryan type victory, this was a grind it out game with two defenses dominating the opposing offenses. The Eagles won, and would eventually set up this rematch by finishing off the season with four straight victories. About those defenses This is the part where you Georgia Tech fans are set straight. Take your higher BCS ranking, and have fun at the CarQuest Bowl. The Boston College defense is a top 10 defense and so is the Virginia Tech defense, as for the Yellow Jackets see #22 defense. The Hokies and Eagles boast a couple of the nations best defenses. They allow under 280 total yards a game. Boston College has given up only 1048 yards rushing on the season, and in their regular season finale, they gave up -6 to Maryland. In Virginia Tech's final 4 games of the season they let up just 399 yards on the ground and averaged 215 total yards per game. Not to mention that against the Hokies, Georgia Tech's 1,000 yard rusher, Jonathan Dwyer, ran for just 28 yards on 10 carries. Of course by now, either by reading my columns or listening to five minutes of BC football talk, you know that the Eagles lead Division 1 in interceptions (25) and interceptions returned for touchdowns (5). Both defenses are among the nations top ten in least amount of first downs allowed per game, Virginia Tech averages the third least at 13.8, better than USC, Penn State, and Florida. Any questions about what type of score we'll have at the end of this one? Beamer Ball meet the 20-6 record of Jeff Jagodzinski The countries favorite head coach, Frank Beamer let me introduce you to the ACC's hottest coach over the past two seasons, Jeff Jagodzinski. Coach Jags has lost just six games over two seasons with the Eagles. His offense elevated the game of Matt Ryan which one would say can be attributed to some of the success that he is experiencing today. This season he's taken 5th year senior and first time BC starter, Chris Crane along with backup redshirt freshman quarterback, Dominque Davis, to a 9-3 record and a second straight trip to the ACC title game. Of those 20 wins, Jagodzinski's Eagles have won games in Blacksburg, Death Valley, Winston-Salem, Raleigh, and at Bobby Dodd. 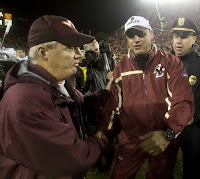 He's 2-0 against his predecessor Tom O'Brien, which to BC fans, means somethings. He's 2-0 in must win games that resulted in trips to Florida and the ACC Title Game. He's 1-0 in bowl appearences, a 24-21 victory over an up and coming Michigan State Spartan team. Can Jagodzinski recruit? Well true freshman, Montel Harris, has something to say about that. The freshman running back has had a monster start at Boston College after not being recruited in the state he lived in, Florida. For a second year head coach, who has had his Eagles ranked as high as #2 in 2007, Jadgodzinski is off to a tremendous start. Will the Eagles repeat what went on in Jacksonville, just a year ago? A 16-16 tie after three quarters was good, 14 unanswered points in the fourth by the Hokies sent the Eagles packing and them to the Orange Bowl. This Boston College team isn't the same as last years. For starters, they have no quarterback who will be a top five selection in the NFL draft and spent more than half the season as a Heisman Trophy candidate. The Eagles have never been a national story in 2008 and weren't ranked any higher in the BCS than they are today. However, they have a better shot at getting to the Orange Bowl than they ever have. Again, this defense is flat out filthy. From Mark Herzlich and Mike McLaughlin, the dominant BC junior linebackers, to defensive tackles Ron Brace and B.J. Raji, they are bigger stronger and faster. The defense is playing better than close to any defense in the country, they've shut down teams when they had to, they've consistently given the offense great field position (a must with a freshman quarterback now at the helm), most important, THEY SCORE. The Boston College defense has literally scored in eight straight games. From blocked punts to returned interceptions, they've put points on the board, and we haven't even mentioned how many times they have given short fields to their offense. If anyone thinks that Virginia Tech is coming in and hanging 30 or more on this defense, question that. Great breakdown...god it is good to see some BC love in the blogosphere. this team has a dirty defense and can run the ball down your throat, i think Dominique will show serious talent in years to come as well.